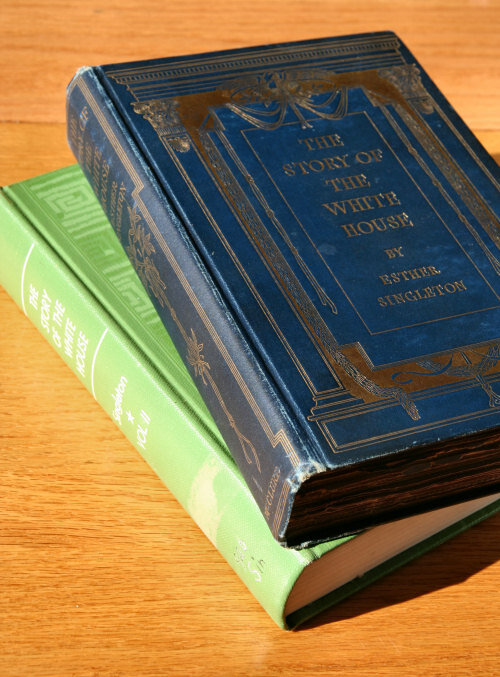 I just received Esther Singleton’s 1907 tour de force two-volume The Story of the White House. I got the two volumes from different sellers, and they are obviously different editions. V1 is inscribed with an elegant hand with a Christmas greeting and dated 1907, so it’s a first edition. The other is likely 1960 vintage. V1 includes a couple of very interesting circa 1800 engravings that seem to be a bit fanciful. V2 has numerous interior photo plates that are just stunning in their sharpness and detail. I’ll capture them this weekend and add them after I finish with the NYPL stereographs. Thanks again to Christina, who pointed me to the copies available (cheap!) on Alibris. Added some photos to the State Dining Room page showing the same kind of changes—chandeliers, Johnson’s geometric walls being repainted—thru the 1870s and 1880s that are apparent in other rooms. It’s too bad that Johnson didn’t have the whole mansion properly photographed before his daughter made it over, so that we’d have a better historical record of the house in Lincoln’s time. After all, they knew they were living in an extraordinary time and that Lincoln was destined to be a major historical figure. UPDATE: Holy crap, I rushed my birthday. When I wrote this post late last night, I post-dated it and skipped a day. Hurray! I’m still only 39! In your face, Jack Benny! Now available: old photos of the Family Dining Room, Master Bedroom, and Living Room in the 19th century. These were tricky to date, and I might not have them right yet. UPDATE: I went back in and found a few pictures that offered zoom functionality. This allowed me to get more detailed captures of parts of the image, which was helpful in the case of the stereographs. Still working on the Red and Green, State Dining, Yellow Oval, and north and south face pictures. Added several images to the East Room page showing the fascinating changes from the 1860s thru the 1890s and even one of JBK’s “portable” theater. UPDATE: I’ve made several changes based on an improved understanding of the changes made by Grant/Patterson in 1873 and Arthur/Tiffany in 1882. I think I need to expand my renovations pages. Added some more pictures from the LOC, NYPL, John in NOLA, and other acronyms. I’ve been sequencing the NYPL pics of the East, Green, and Red rooms, scanning for all the little details that indicate the date (since almost none of them are dated) and I’m getting a little dizzy. I think it’s all the 3D effects from looking at the stereographs. UPDATE: Link to WHHA PDF where I got the 1918 China Room pic, also containing the pic of Gugler’s Oval Office design with different 1934 window treatment. Added several images from the NYPL stereographs of the Blue Room from the 1860s, 1870s, and 1890s. You can see the changes in chandelier, sconces, and wall coverings over the decades. More from the LOC, including four spectacular color etchings from around 1887. UPDATE: Had to remove the links to the JBK video, since they had been removed from YouTube.